You often come across scenarios where you have to calculate a running total of a quantity. A running total refers to the sum of values in all cells of a column that precedes the next cell in that particular column. Let’s take a look at an example to make this clearer. 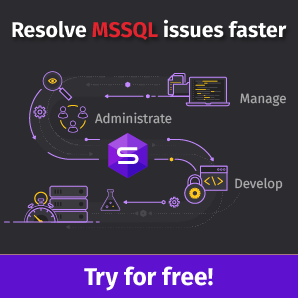 SQL Server Management Studio is considered as the default integrated graphical user interface tool that has been used for many years to configure, manage, monitor and administrate the SQL Server instances hosted on the local machines, on remote servers or in the cloud by all SQL Server administrators and developers. It provides us with editing, debugging and deploying environment for many languages including T-SQL, XML, MDX and DMX languages. Due to the fact that Microsoft SQL Server can be installed now on the Linux platform, and that the SQL Server Management Studio tool is not compatible with any operating system outside Microsoft Windows, the need for a new cross-platform graphical user interface appears. In this article, we’ll look at how an index can improve the query performance. Indexes in Oracle and other databases are objects that store references to data in other tables. They are used to improve the query performance, most often the SELECT statement. They aren’t a “silver bullet” – they don’t always solve performance problems with SELECT statements. However, they can certainly help. Let’s consider this on a particular example. A subquery is a powerful way to find the data you want to use for another query. They are often used in SELECT and UPDATE statements to make these queries more efficient and easier to maintain. There are several different ways to use subqueries in UPDATE statements. Let’s take a look at each of them. I continue a series of articles on the basics of EXPLAIN in PostgreSQL, which is a short review of Understanding EXPLAIN by Guillaume Lelarge. To better understand the issue, I highly recommend reviewing the original “Understanding EXPLAIN” by Guillaume Lelarge and read my first and second articles. In my previous article, we started to describe the basics of the EXPLAIN command and analyzed what happens in PostgreSQL when executing a query. I am going to continue writing about the basics of EXPLAIN in PostgreSQL. The information is a short review of Understanding EXPLAIN by Guillaume Lelarge. I highly recommend reading the original since some information is missed out. Why does it take so much time to execute a query? Why are there no indexes? Chances are you’ve heard about EXPLAIN in PostgreSQL. However, there are still many people who have no idea how to use it. I hope this article will help users tackle with this great tool. This article is the author revision of Understanding EXPLAIN by Guillaume Lelarge. Since I have missed out some information, I highly recommend you get acquainted with the original.